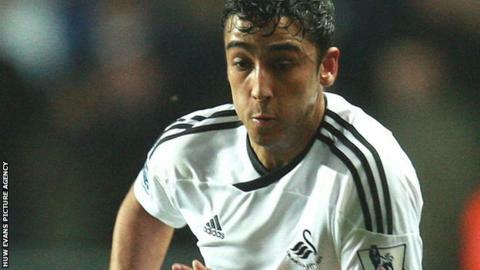 Swansea City's long-term injury victim Neil Taylor says he hopes to sign a contract extension soon. The 23-year-old left-back, who is out for the season with a broken ankle, has almost three years left to run on his current deal. Swansea have also started contract negotiations with Ashley Williams, Michel Vorm and David Cornell. "We've been talking about a new contract for a few months. We were very close before the injury," said Taylor. "But in fairness to the club they have already said they will honour the new deal despite the fact that I won't play again this season. Taylor, who represented Great Britain at the London 2012 Olympic Games, has emerged as one of Swansea's key players since joining from Wrexham in 2010. He made 32 appearances as the club won promotion from the Championship under Brendan Rodgers and was the first choice left-back in the club's debut Premier League season. But he suffered a cruel blow in the third game of the new season when he suffered multiple fractures and a dislocation to his left ankle against Sunderland. "I want to come back fitter and stronger next season,'' added Taylor. "And I'm happy in the knowledge that if I get my rehab right then I'm confident Swansea City will still be in the Premier League." Goalkeeper Vorm and centre-back Williams have combined with Taylor to form a formidable defensive unit. Swansea are keen to tie down Vorm and Williams, who both have almost a year and a half to run on their current contracts, to long-term deals. "We're optimistic that we'll be able to get things sorted with a number of players," said chairman Huw Jenkins.